Another challenging game of Gods, men, and their monuments from Reiner Knizia! The game spans 1500 years of Egyptian history. 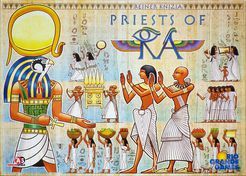 The priests of Ra seek to extend their power and fame. They do this by directing farmers, warriors, merchants, and scribes. They cause others to build granaries, fortresses, markets, and libraries. And they erect a gigantic pyramid for the glory of the Sun God Ra! This game is a rework of Ra, with most of the same rules but completely different scoring tiles that come up for auction, some of which are two-sided, requiring players to choose which side they will make available for themselves... and for their opponents.